I should really thank my Mentor Gautham Raj for starting COMPED Program where the wish of thousands of children of learning about the usage of computer and becoming the Web Champions is going to come true. Web Champions ?? Yes, the mission of Webmaker project is to make the world “Web Literate”. This can be possible only when the people whom we teach are computer literate. Making the World Computer and Web Literate is the final aim of COMPED Program which is a part of Webmaker project. 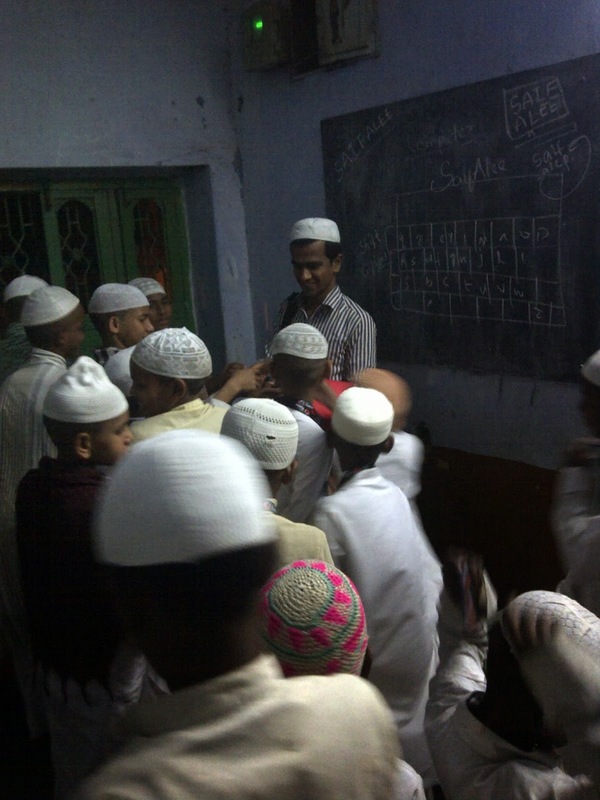 I have initiated this program in a small residential school which is nearby to my home where there are 20 small children learning Islam for free. These students don’t know what a computer is!! 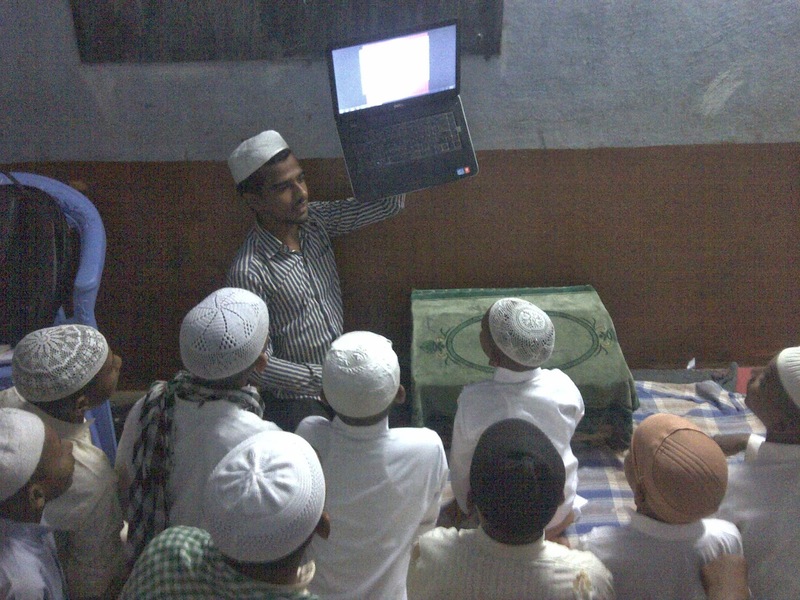 Making them understand about computer was a challenging task for me. This cannot be achieved in one day or two. Then, I finally decided to dedicate 1 hour every day for these children and contribute towards Web Maker project. I spoke to the head of the school regarding the mission of Web Maker Project and asked him permission of 1 hour for everyday. He happily accepted my request and allotted time of COMPED class from 8:00 – 9:00 pm, everyday. I started teaching them from 20th Jan 2014. The day I went into the school, I found mix of students of different ages (6 years to 14 years). I fell in love with the small children who live very far from their parents who are very poor and couldn’t afford for their education and food. These Students are so energetic and passionate to learn about usage of computer and the web. When I started the class, all the faces were blooming with happiness. I asked them where have you all seen the usage of computer? A small child replied I have seen in my home town (Bihar), another kid told I have seen in railway station, another child replied I have seen in a school, like wise I got many replies. Then I asked would you all like to use it? I got a loud answer yes, yes, yes!! I then, headed towards blackboard and drawn a block diagram of computer. Every one replied 5, then I told let me show you all how this question can be given to a computer, who will perform calculation and where can we see the answer in the next class. I asked everyone to draw the above diagram and then I finished my class. Everyone after completing the class came to me and shook their hands with me with a smile on their faces. I Felt so happy. 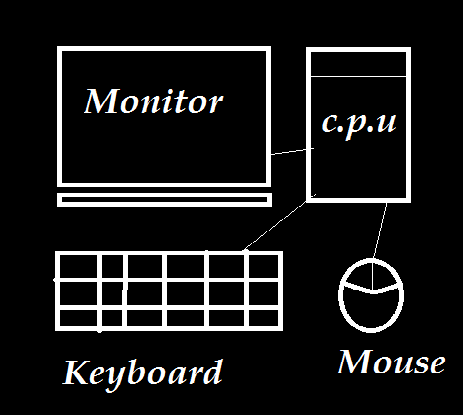 On the next day, I have again drawn block diagram of computer and described about Keyboard (which is used to give question), C.P.U (which is used to perform the calculation), Monitor (which is used to display the answer) and mouse (which is also used to give a question). I again took example of 2+3=? And told everyone that let’s solve this question using computer. Me: I asked them, to give a question (2+3=?) to a computer, what do we use?? Children: Few replied keyboard and few Mouse. Me: Who will perform the calculation? Me: Where do we see the answer? C.P.U is used to perform large calculations like (50938303 X 309373) and monitor to display the question which we are keying in and to view the answer given by the C.P.U. Everyone indirectly understood the concept of basic input and output devices. On the third day, I asked few questions on previous two classes and everyone was so happy and enthusiastically answered to the questions. I told them now let’s learn in details about C.P.U, Monitor, Keyboard and Mouse. Everyone nodded their heads. I headed towards blackboard, drawn the diagram of only C.P.U and asked them a question, what all the steps do you perform in mind to calculate 2+3=?? A 12 year child replied, First we take 2 and 3 and save in mind, then we see the operator +, then perform calculation in mind and give answer using mouth. I appreciated that kid for his wonderful answer and gave him a goodie and told everyone that in the same way, computer also performs the calculations by taking the question in and displaying the output on the monitor. 4. 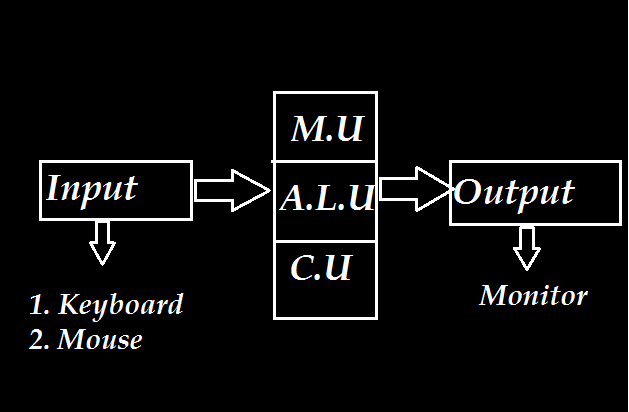 A.L.U is used to perform the calculation and send it to C.U which stores the answer on M.U and sends it to Output. 5. Output is used to display the answer on the Monitor. In this class, few students were unable to grasp at one time, then I decided to explain it in the next class even. On this day, I repeated the previous class once again and I explained about Monitor, Keyboard and Mouse in detail. I took much time in explaining about Keyboard keys (CAPSLOCK, Shift Key, Space bar, arrow keys and all the 26 alphabetic keys). This day I wanted to show them practically what they learnt. My cousin Jamal was also interested in what I was doing and he too started accompanying me in teaching. He took a practical session to students by opening my laptop. First I asked children to write their names on a piece of paper, and then Jamal helped each one of student to write their names in computer. Children were too happy, and that happiness made me so satisfied and made me feel proud on myself. This day, I wanted the student’s to explain about hardware and software terms. For this, I took an example of human being. I asked the students what do you call the external body parts they told body organs then I asked what is inside of a human to which makes him live?? They replied soul!! In the same way, I explained the external parts of a computer are known as “Hardware” (C.P.U, Monitor, Keyboard and Mouse) and the internal soul of a computer as “Software”. Then I explained about O.S and told the story of evolution of Linux!! In these 6 days, I found few students writing in notebook and few are not. When I asked the reason, I got to know that just because they don’t have money to purchase notebooks and pens they are not writing!! Felt very bad!! Will find out a solution to provide them notebooks to write. Find more images on Flickr! !